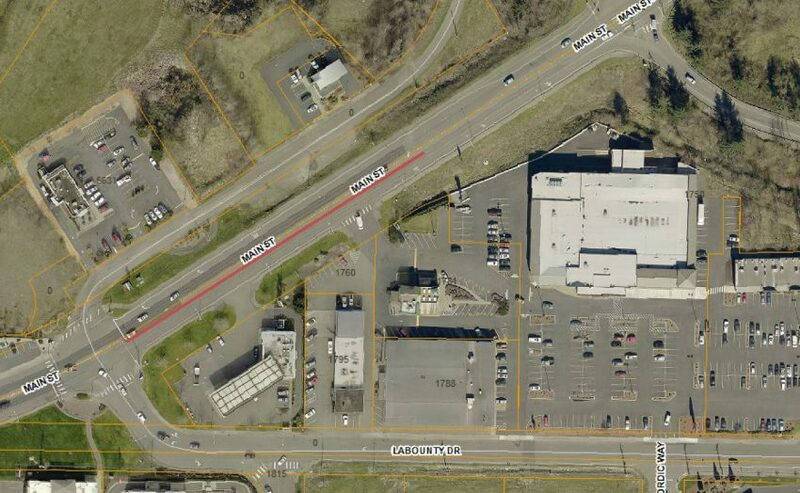 Starting the week of June 4th, the City will be modifying the channelization of Main Street, eliminating left turn movements between Main Street and the North Sound Center parking lot located between I-5 and Labounty. Public Works crews will be installing plastic traffic delineators along the centerline of Main Street in an effort to prevent drivers from making left turns into and out of the North Sound Center parking lot. Drivers wanting to access the North Sound Center parking lot from Main Street or westbound Main Street from the parking lot will need to utilize the intersection at Main and Labounty. This change was motivated by the use of “Intelligence-Based Policing”, where the Ferndale Police Department works hand in hand with the City’s GIS mapping team to identify hot spots by layering crash data into the City’s GIS mapping database. Utilizing this approach, the City is better able to identify changes in accident distribution and identify areas where increased patrols or modifications may be necessary. For more information, please call the Ferndale Public Works Department at (360) 384-4006.